The shortlist includes nationwide chains – such as Pizza Express and Costa Coffee – tiny cafés in Camden Lock, B&B’s in the Lake district and university colleges – while the ‘freefrom products manufactured for food service’ range from breakfast cereals to Bakewell tarts and gluten-free beer from Westerham Brewery. A range of bottled beers is available from Westerham Brewery, which have been certified gluten-free. These can be purchased online for delivery nationwide, and from selected outlets in the Southeast and London. Contact the brewery for details on 01732 864427 or go to www.westerhambrewery.co.uk. The FreeFrom Eating Out Awards were launched in advance of the new allergen declaration regulations coming into force in December this year. They are designed to encourage allergen awareness and to celebrate excellence in the provisions of gluten-free, dairy-free and low-allergen food in the food service sector. The winners will be announced at a presentation party at 4.30pm on the 18th November, the first day of the Food Matters Live event at Excel in London’s Docklands. The presentations will be made by awards patron, celebrity chef Antony Worrall Thompson. FreeFrom food – food free of gluten, wheat, dairy, soya, nuts and other allergens – has become seriously big business in the retail sector with the market set to grow to over half a billion pounds in the next three years. But, the rapidly growing number of those who either need or choose to eat ‘freefrom’ have long complained that, while good freefrom food is now relatively easy to find in the retail sector, eating out ‘freefrom’ remains difficult and frustrating. This is partly due to the lack of choice but mainly because so few people in the food service industry understand about food allergy and coeliac disease. 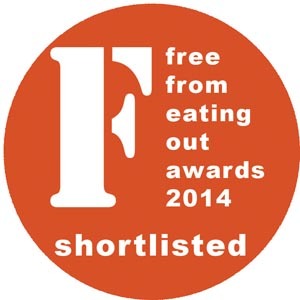 The team behind the FreeFrom Eating Out Awards has worked in ‘freefrom’ for over 20 years. They run one of the web’s largest informational resources for allergy and intolerance, FreeFromMatters with over three quarters of a million unique visitors a year.• The team is headed up by freefrom expert, food/health writer Michelle Berriedale-Johnson who presents regularly on freefrom and has written over a dozen books on allergy/freefrom food alone. For the last seven years, they have also run extremely successful retail Freefrom Food Awards which have done much to drive innovation and excellence in the retail freefrom offer. The FoodMatters Live event at Excel in November is a new annual event exploring the links between health, food and nutrition – one of the most important challenges of our time. Westerham Brewery beers certified gluten free can be found in detail at http://westerhambrewery.co.uk/our-beers/. Westerham Brewery Gluten Free certificates are published online at http://westerhambrewery.co.uk/gluten-free-certificates/.